Explore the Dulux World of Colour® and discover Electro, a range of unique anodised look finishes which have been cleverly designed to subtly change in appearance as light conditions alter during the day. Electro is available in a range of 22 on trend colours that are delivered with warranty grade advanced super durable polyester thermosetting powder. The range is ideal for interior and exterior use on most commercial, residential and non-habitable (eg. furniture) projects. The Electro range offers architects and specifiers an alternative colour range to anodising and includes popular shades in traditional colours such as Silver Reign, Medium Bronze, Sensational Champagne, Dark Bronze, Fresh Gold and Black Ace. Electro also features bold and modern colours including the chameleon-like properties of Poyple and Blue Gold, the bright Blueit, FRed, Canary and Bright Spark and the subtleties of Tiberius, Green Lantern, Blue Night, Clean Linen and Flat White. The range has been designed to enhance modern building styles, and to complement modern internal decoration trends with an on trend flat anodised look finish. The Electro range offers guaranteed performance on appropriately pre-treated aluminium and steel* with excellent colour retention and a super durable finish. Electro has been formulated to meet AS 3715, AAMA 2603 and AAMA 2604 standards. 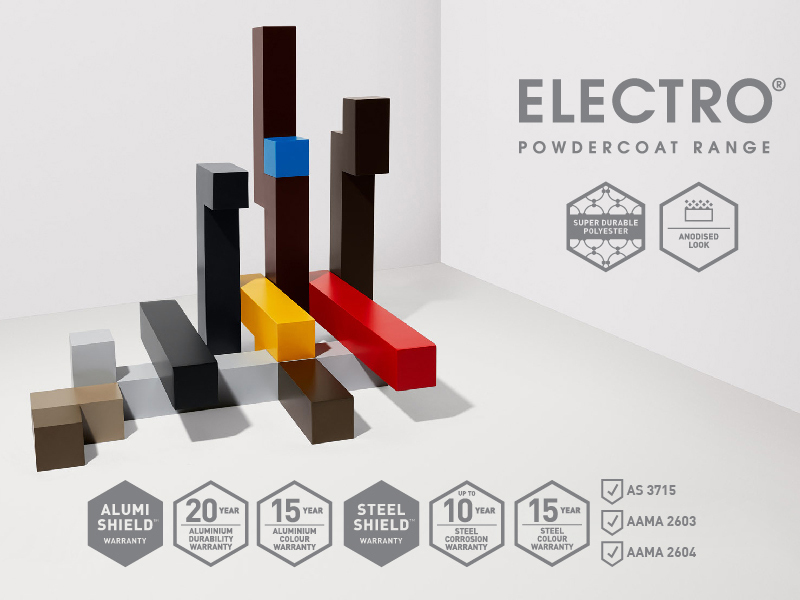 The Dulux Electro powder coat range is supported by Dulux Alumi Shield™ and Dulux Steel Shield™ warranties when applied by a Dulux Accredited Powder Coater to the warranty specification on recommended project types and conditions. An Alumi Shield™ warranty is made up of a 20 year aluminium durability warranty and 15 year aluminium colour warranty. For more information on warranty requirements or to view the Electro product brochure and order colour swatches visit https://duluxpowders.com.au/products/electro/. Only Dulux Accredited Powder Coaters are able to issue our Dulux Alumi Shield™ and Steel Shield™ warranties after demonstrating their capability to meet stringent quality conditions and international standards. To find an Accredited Powder Coater for your next project visit www.duluxpowders.com.au/accredited. Need advice about Electro or other powder coat ranges? Our dedicated consultants are available to help simplify the specification process, saving you time and money by providing the right coating advice for your project. Call today on 13 24 99 or visit www.duluxpowders.com.au. *Refer to warranty details for more information.